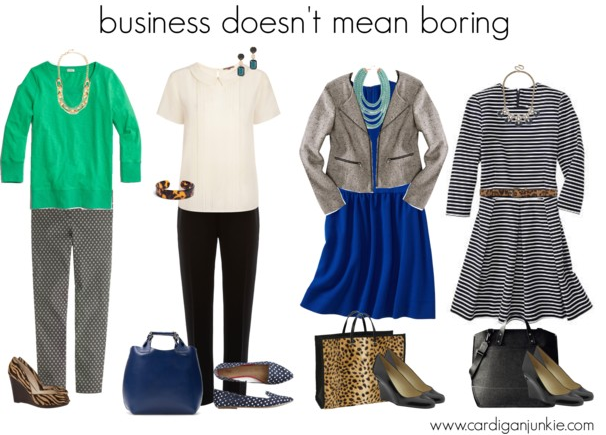 cardigan junkie: Business Casual Doesn't Mean Boring! Oh hey, internet. Sorry I ended up taking a little unplanned break, but I am back after a fantastic weekend with my family and some really busy work days that didn't leave time for blogging. I know that some offices won't take kindly to those who push the envelope (which sounds terrible to me!) but for the most part, I think there is absolutely nothing wrong with injecting some personality into your wardrobe and wearing classic silhouettes in unexpected colors and prints. Unless you are required to wear suits in a conservative setting, you probably have a little more freedom than you realize! In my opinion, wearing a black striped dress instead of a solid one does not suggest that you're any less capable, especially when you pair it with a ladylike wedge. You can also make your bright dresses work at the office (if the fabric is right) by wearing them under a blazer or cardigan. Also, basic slim black slacks suddenly feel more Deschanel-esque when paired with a printed flat and creamy blouse, as do a subtly patterned pair that can get down to business with a sleek sweater as well as your favorite evening top and heels. Isn't that more fun than a plain white button-down? I agree.